Most of this time is in the oven. Yes, you can have your pie and eat it. This isn't so much a recipe as a quick guide to vegan pies and the trimmings. Should you wish to make an easy home-made version, click here for our Big Puff Pie recipe. But in the meantime, here is the cheat's version for all you busy people! What flavours? Vegan pies range from the traditional 'vegan meaty' type - Linda Mac and Fry's - to Clive's range which includes things like Lentil & Olive, Minty Chickpea and Aloo Gobi (cauliflower and potato) as well as French Cassoulet and more. Some of Clive's are also gluten-free as well as vegan. Where to buy: Clives Pies, Linda McCartney and Fry's all do a range of vegan pies - Linda Mac's vegan range is clearly marked, Fry's range is completely vegan and many of Clive's pies are vegan but not all - again, the package details should be clear. Linda Mac are everywhere; Fry's are in Morrison's, Holland & Barrett, independent health food shops and delis etc; Clives in Holland & Barrett, independent health food shops and delis as well as online (including Ocado and Goodness Direct). Gravy: Bisto red tub or Onion; other vegan friendly gravy granules, such as Sainsbury's Vegetarian Gravy Granules, Tesco Vegetable Gravy Granules. 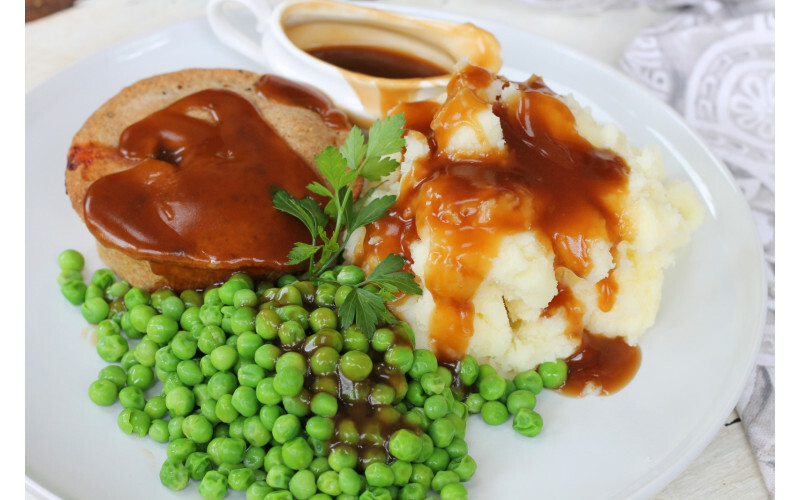 NB most gravy granules contain palm oil so if you want to avoid that, use a powdered version like Bisto Original Gravy Powder and add a bit of oomph with a dash of soya sauce or a teaspoon or two of yeast extract (Marmite and own-brands) or a blob of dark miso. Vegetables of your choice: cabbage/kale/Brussels sprouts/broccoli plus any other type, eg carrots - make it a rainbow! 1. Preheat the oven according to the pie packet instructions. 2. Bake the pie - and any other oven options you might be using, eg baked potatoes or wedges. 3. Meanwhile, make the mash if using fresh or tinned potatoes. 4. Make the gravy and put the veg onto steam or microwave.